I’ve spent the majority of my early twenties coveting oversized ‘IT’ bags. It was a time when Paris Hilton’s reign was short lived, only to be rapidly replaced by bohemian goddess and style icon BFF Nicole Ritchie. And when Kim K was nothing more than Paris’ “servant-friend-thing”. Substantial, generous and ample was the handbag game; all with delicate designs and conflicting vibrant hues. These bags were the kind you could easily fit your life essentials comfortably into and then some. They’d traverse from work to play effortlessly and they were also the ultimate travel companion. Of course the humble shoulder and tote bag is far from extinct. In fact there are many delightful options available to this day. However, much to my dismay, these days we seem to glorify the minuscule on trend kind. And that has been one trend I’ve had incredible difficulty embracing after having spent the majority of my life proudly lugging around extensive shoulder bags. So I curated a wishlist and selected these five pieces from Sammy Dress to prove that these roomy tote and shoulder bags can be equally as chic and alluring as their petite counterparts. Plus they seemingly have the additional advantage of being wearable and spacious. For me, I love simplicity and minimalism in a handbag. 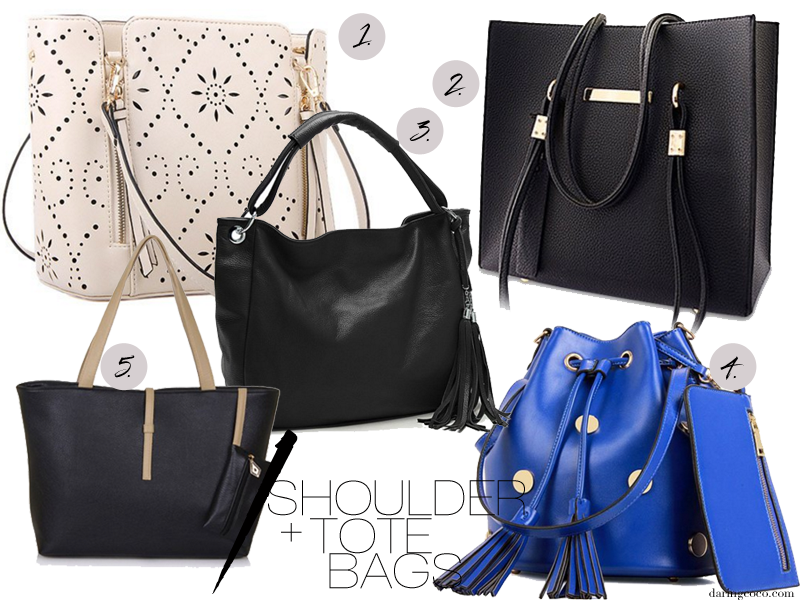 Be it in plain, sleek black or a stylish print, I am a sucker for a gorgeous shoulder and tote bag. I also revere hints and touches of gold hardware adornment too. On a side note, obviously there’s a bucket bag thrown into style note mix because if you hadn’t noticed, it is so freaking adorable and giving me a serious case of sartorial accessory cravings. The only problem is to decide upon a colour. Blue as pictured, or go the red, cream or brilliant black?